Elyssa and I tried to push our way to the 1:00-1:10 swim group. Unfortunately there were so many people it was exhausting just trying to sneak between people. Finally we settled somewhere in the 1:10-1:20 group. We didn’t want to fight anymore, plus, our time started when we crossed the start line anyway. The National Anthem played and I couldn’t stand still. Once that was over the gun went off and the first group of swimmers dove in. We finally got to the start line and were at the front of the group we were in. Once we were released we were diving into the water. We ended up starting 6 minutes after the first wave went in. We opted not to do a warm-up swim so this was the first time in the water for the day. The water was calm and warm! Elyssa and I started swimming side-by-side for a few minutes. Whenever we swim together we are literally in-sync stroke-for-stroke! I was completely at ease. It was great! Elyssa told me that she remembers us both splitting off and coming back together after we swam around a guy. Unfortunately we didn’t end up together the whole time. We quickly got separated because we were both swimming over people. This is when I got mad that we weren’t able to start sooner. I lost Elyssa and was focused on swimming around people. If we had started in an earlier group we wouldn’t have had to waste time moving around other swimmers so much. I didn’t really think about the weather but I do remember looking up a few times to see the clouds clearing. I figured if it wasn’t storming like it did during last year’s race I didn’t need to worry about it! During the first loop I was really calm (other than being mad about losing time swimming around other athletes). 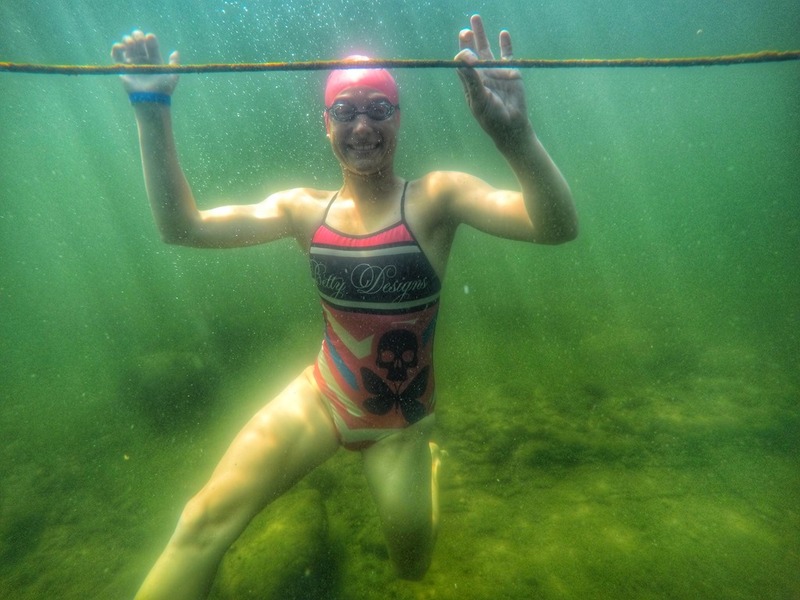 I am very confident in the water but I usually get a little anxious during the first few minutes of any swim. I kept my cool and just focused on moving forward as fast and efficiently as I could. I was shocked at how “nice” of a swim it was. I didn’t get beat up at all. Sure, I had a few kicks here and there but nothing that rocked me. The turn around point on the first loop was a little congested but I snuck through and didn’t get held up too much. At this point I thought I could see Elyssa in front of me so I knew we were moving at a good pace. The end of the first loop came up fast, it was time to get out and dive back in for round two! 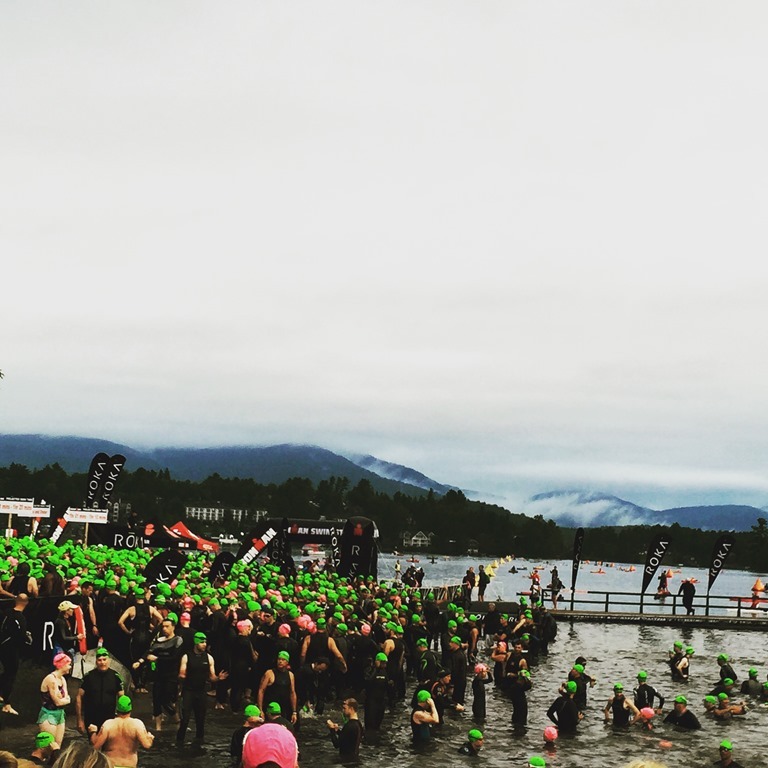 One thing I always notice during triathlons is the time that people waste standing up at waist deep water and trudging through to the exit. Why do people do that? Swim until you can’t swim anymore! I cruised by so many people during the last part of the swim because they were all walking! Right before I dove back in I moved my goggles around. I was having a tiny bit of leaking and didn’t want to deal with that during the second loop. Once my goggles were good I dove back in and was on my way. If you’re familiar with Mirror Lake you know there is a cable underneath the course that everyone wants to swim above because you don’t have to sight. I never planned on positioning myself above the cable because I didn’t want to fight people for it. Somehow, during a good majority of both loops, I was positioned right over the darn cable. I just went with it. It wasn’t as crowded as I expected which was nice. The second loop wasn’t as congested as the first but I was still swimming around a lot of people. Once I hit the turn-around I had a pretty clear line the whole way back into the beach. I felt like I was in a great groove. The end of the course always feels so long but once I could see the swim exit I was excited. I couldn’t believe it, 1/3 of my day was about to be over! I was a little annoyed when I exited the water and saw the time – my watch said 1:08 something (I started it about a minute late). I was hoping to be faster but I just tried to let it go. *Obviously the above photo wasn’t taken during the race but I wanted to show the cable! I ended up putting my Garmin above my wetsuit sleeve because I didn’t want to fight with it. During shorter races I put it underneath. I ended up fumbling with that while trying to unzip my wetsuit. I’ll stick with putting it underneath in the future. Luckily, the wet suit strippers were amazing. I was out of my wetsuit in no time. Running from Mirror Lake into transition was awesome. I could see a bunch of my friends and hear them cheering and it pumped me up. Ironman does line the run with carpet but it was pretty slick. I told myself to slow down because I knew I would be pretty embarrassed if I wiped out in front of all the spectators. I made it into transition and headed towards my bike bag. I grabbed it and was on my way to the changing tent. As soon as I reached the changing tent I had a volunteer assisting me. She helped me with everything. She asked me what I needed and showed me everything I had in my bag. I immediately unzipped my one-piece and slathered myself in chamois cream. It was a little tough as I was soaking wet but I did what I could. Once I zipped my suit back up I stuffed my pockets and bra with nutrition. I couldn’t decide if I wanted to wear socks or not. Since I was so wet I didn’t feel like having to deal with them so I put them back in the bag. After that I put my helmet, sunglasses, and watch on. I grabbed my shoes and ran with them because I didn’t want to wipe out on the wet concrete that led us into the grassy part of transition. I made it to my bike rack and was so happy when I saw a volunteer waiting for me with my bike! I put my shoes on and hustled out of T1. I saw two friends that work for Ironman and that just made me smile even more. Holy crap, it was time to ride 112 miles! I felt a little frazzled in T1 but I think I did a pretty good job doing what I needed to do. I would have been a disaster if I didn’t have the volunteers assisting me.